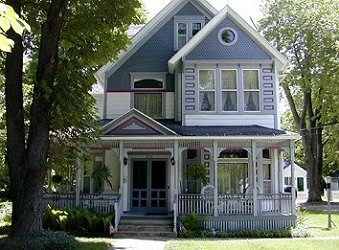 1880's Queen Anne Victorian with original chandeliers, fretwork, Cherry and Oak trim. The inn is furnished with family and area antiques. We are located on an acre of land in the foothills of the Irish Hills, in the quaint quiet Victorian Village of Brooklyn. 1 1/2 blocks from fine dining, antiques and shopping. 15 minutes from 52 lakes. Enjoy hiking, biking and antiquing. The bed and breakfast has 6 rooms with private baths and air conditioning. 4 are Jaccuzzi Suites with Jacuzzi's, fireplaces, queen size beds, bathrobes, refrigerators and TV-VCR. Located on the property beside the main Victorian house is a 1920's bungalow, decorated of the 1920's. The bungalow houses 2 of the Jacuzzi Suites for those looking for privacy. A hot breakfast is served for all and is included in the room rate along with juices and waters in all the rooms. Prices are $84.50, regular bed and breakfast room and $165.00 for the Jacuzzi Suites plus tax.